As we have observed in previous posts, Denver experienced great growth from its earliest days as a mining camp. 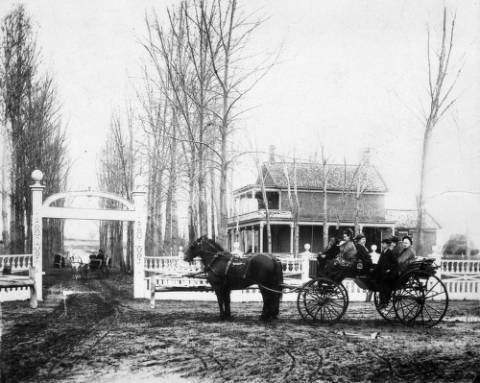 In 1859, there were 1000 residents on either side of the creek. Thirty years later, over 100,000 souls lived in the “Queen City of the Plains”. Explorers Zebulon Pike and Stephen Long would be astonished to learn that the region they saw as a natural barrier to the expansion of the the United States, is now a verdant metropolis of millions. Denver’s success and survival was inevitably tied to it’s ability to harness and tame the uneven flows of the South Platte River and Cherry Creek, and ultimately sources higher up. The legacy of these pioneer efforts still serve our citizens, and lives in La Alma-Lincoln Park today as home to Denver Water. The utility that provides the precious resource to 1.3 million people in Denver and to many surrounding suburbs is still headquartered here. And though the Water Board was incorporated in 1918, the tale of Denver’s water supply winds back and through our borders, beginning with a ditch, and a dream of a great city. Many of the men that arrived early had already gained or lost fortunes elsewhere. Our history is littered with the economic turbulence of an unregulated economy, but the Wall Street panic of 1857 was significant for Denver. The news of gold in the Pike’s Peak region offered our pioneers the second chance they needed, and they were determined to make the best of it. Many strove to make new fortunes in building a city, through investments in the infrastructure that would make life here livable, and marketable. If there was gold in these hills, they knew lasting wealth would come to those with the best-placed land and control over the services. Already acquainted with manipulating the levers of power, they saw great opportunity here. Fourth Territorial Governor A C Hunt, La Alma-Lincoln Park’s resident city builder, had found wealth during the California gold rush, returned to Illinois, became Mayor of Freeport, and lost it all before scouting his prospects here in 1858. It should be no surprise to find his name listed as President of the Capital Hydraulic Company which had, conferred by the Kansas Territory legislature of 1860, “the power and exclusive right to direct the water from the bed of the South Platte…and the Cherry Creek” (Hall, 1889). Cities are most often built on coasts or rivers, and traditional patterns of human development revolve around sources of water. This observation was not lost on our forefathers. Most arrived from a southern approach which offered a vision of bountiful fields along the Platte Valley that could one day feed a city. 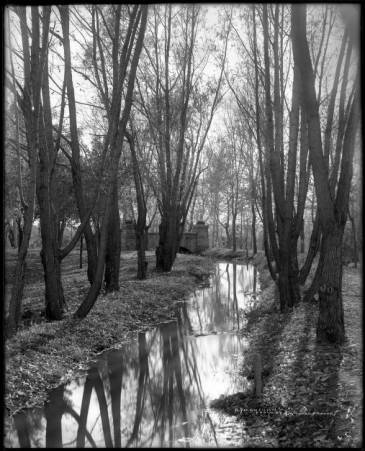 Long before the first flood of 1864, when a little stream trickled through the wide and dry Cherry Creek bed, the first rough trenches were dug from the river. They were primarily employed for growing food, as the high cost of importing goods by wagon made local farming a necessity and top pursuit in the early years. By the introduction of the railroads in 1870, Denver’s water infrastructure was drastically improved. Although we officially became the Colorado Territory six months after Kansas’ statehood in 1861, and ultimately joined the Union as the “Centennial State” fifteen years later, the questions of jurisdiction and authority were quite debated in Denver’s early history. This point is relevant to our water story, because like transportation and energy, a utility needs significant investment, should benefit the population equally, and requires broad cooperation of its citizenry. Many undertakings at self-governance, such as the town companies, city councils, and constitutional conventions for both a Territory and State, were intended to bring order to this feverish new town. City leaders had some success in bridging the creek by promising and/or rewarding individual investments with town lots. They also made some attempts at encouraging the building of an irrigation ditch, but the debates over rights and rewards thwarted any real progress. This wrangling for power aside, the distant Kansas Territory legislature was the only jurisdiction recognized by Washington D.C. 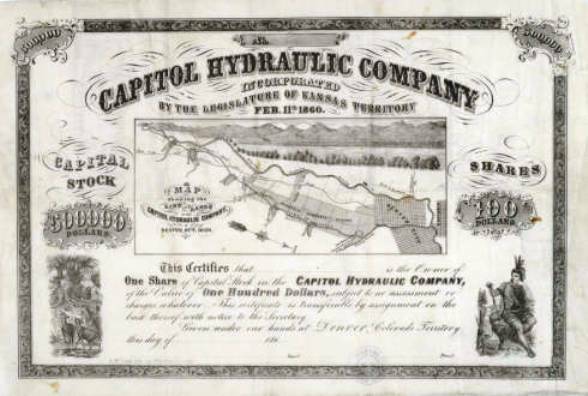 So, Denver’s first real water right was granted through Captain R. Sopris’ efforts as a delegate, and delivered the franchise for the Capitol Hydraulic Company to Denver in 1860. Stone’s History of Colorado describes and reminisces on this achievement,”Under this act, the present ‘City Ditch’ was built and operated. The men named, realizing the necessities of the city then and of its future,…secured the enactment of this law”(Stone, 1918). Hunt’s good friend and business partner, John M. Clark was the initial surveyor. It seems he was unfairly blamed for the Capitol ditch’s early difficulties due to his lack of experience. But hindsight reveals that the greater issue with this first attempt was the economic slowdown and social disruption of the Civil War beginning in April of ’61. Although ten miles were constructed before work was abandoned due to a shortage of funds, when work resumed on the ditch in 1864, it would begin a bit further upstream from the city. 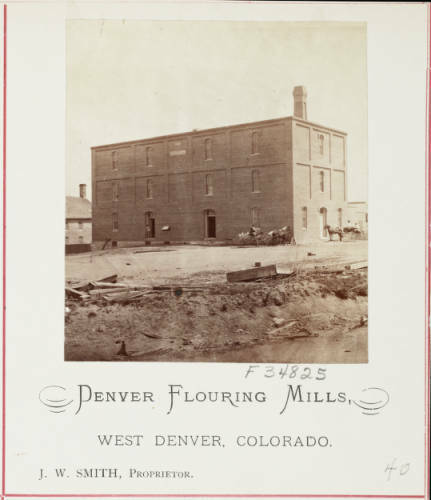 Despite assumptions reached about Mr. Clark’s engineering expertise, the original intake proved adequate to be utilized for many years by Mr. Richard S. Little’s “Rough and Ready Flour Mill.” Though his flour was well regarded and his mill one of the areas first successful businesses, this “high priority” water right was eventually sold to the Denver Union Water Company in 1903 and was passed on to Denver Water in 1918. Mr Little is probably more widely recognized as the namesake of our neighboring suburb, Littleton. The Colorado Territory offered promise, but survival was hard fought. While the settlers struggled with drought, flood, fire, and swarms of grasshoppers, they also lived in constant fear of Indian raids. As mentioned previously, the Civil War was a huge disruption to the best laid plans of our forefathers. Though largely loyal to the North, some of our earliest residents hailed from the South, and many of them returned home for the fight. Each side had long feared new states could disrupt the delicate balance of power, and Colorado’s leaning favor to the Union was likely in the minds of secessionists as the war began. With the world focused on war, Denver did not receive the population boom promoters had hoped to see, and her future seemed uncertain. Hunt was kept busy in politics, as Lincoln’s appointee for US Marshall in 1861, and was likely divested from the Capitol Ditch Company by 1864. His departure made room for some needed new capital and introduces an important new character to our story. Denver’s growth and dry-water seasons quickly lead to concerns for the unsanitary condition of the Platte and ditch water supply. Footloose and fancy free hogs offered Denverites a good supply of bacon, but created a wet mess of things when the ditch came to town. They provoked a strange controversy which was documented in the editorial pages. One such letter printed in the Denver Tribune read: “Let us make our town attractive by planting trees along the sidewalk, and make our homes beautiful by cultivating gardens and shrubbery and let our City Council do their duty, by first shutting up the filthy hogs, and then giving us plenty of water for our gardens, our yards, our sidewalks and our streets,”(Mosley, 196?). Officials wisely chose to pen the pigs over filling in the ditch, but human waste infiltrated the water table, too. Fear of typhoid and cholera left the citizens clamoring for a more reliable and pure water source. As population and demand continued to rise, intense competition to provide it ensued for years to come. Most noteworthy of efforts was James Archer’s Denver City Water Company in 1870. Already provider of the gas works that lit up the city, he introduced “Holly Pumps” and underground plumbing as the solution for Denver’s water woes. Just as important were the new hydrants, finally installed to protect residents from the constant threat of fire. But, Archer’s victory was short lived. Drought level waters and a decade of growth surrounding the 15th street pumping station further threatened the quality of Denver’s water. 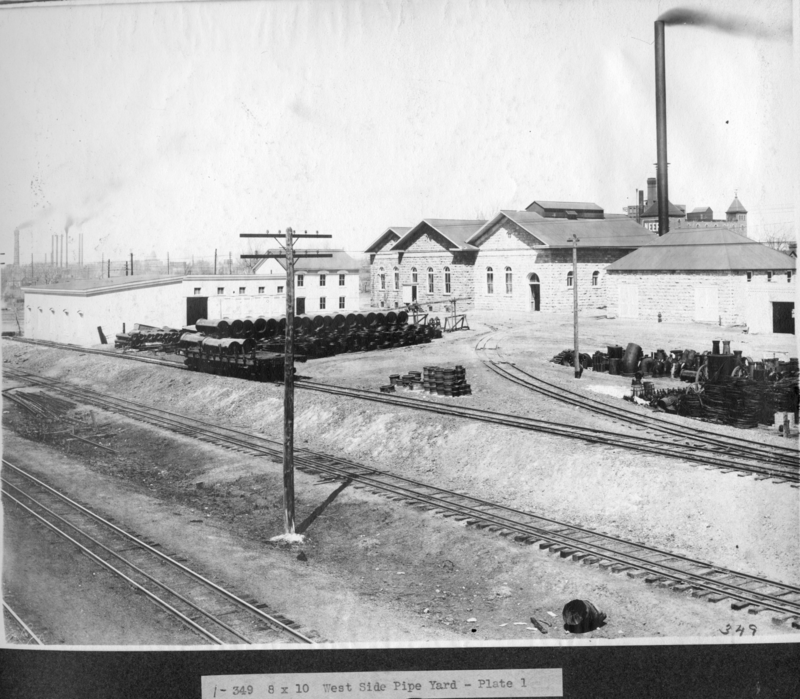 In response, his newly named Denver Water Company connected an impressive new West Denver Water Works facility which, during its construction in 1880, was expected to remain far from the soils of the city. The project involved a 2.44 mile canal from the Platte, which widened to provide a reservoir attached to the pumping station and the network of underground pipes throughout the city. Not a trace remains of the large holding pond that stretched from near Alameda Avenue to Seventh Avenue, but is plain to see on maps from the period. 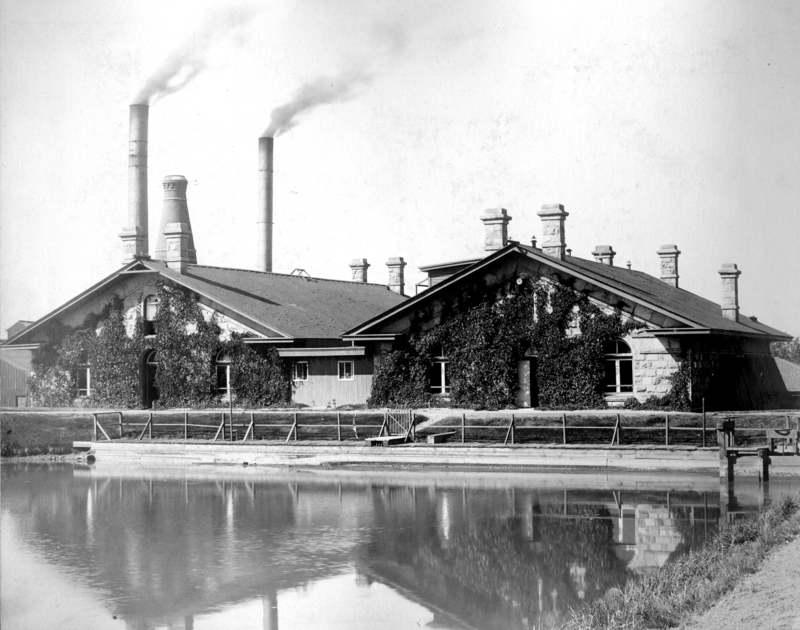 It was called “Lake Archer,” named after the unexpected death of the company’s founder in 1882. Pulling from the Platte was never a lasting solution for Denver, as demand and supply were never in balance for long. Still fearful of the quality and subject to shortages, citizens soon realized they would have to take it from the mountain. 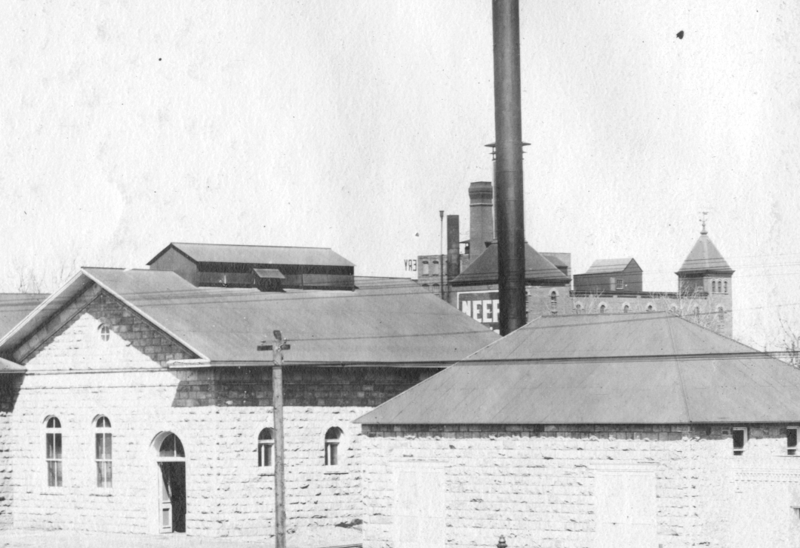 A landmark of the original water works facility is still standing today on Denver Water’s 12th Ave campus. The “Three Stone” buildings that housed the pumping apparatus has been converted to a company and community meeting space that doubles as a museum of Denver Water history. Notable investors in Archer’s Denver City Water Company included David Moffat and Walter Cheeseman, who soon formed a subsidiary to develop their vision of a mountain pipeline to deliver from a clean and abundant supply. Later they departed to create the Citizen’s Water Company when the city awarded their own franchise in 1889. The Denver Water Company, rose to the competitive challenge by first luring East Coast capital, merging with competitors, and then slashing rates. However, they couldn’t compete with Citizen’s final offer of free and clean water. By 1894 the war was over, and The Denver Union Water Company represented the consolidation of all the systems, with Moffat and Cheeseman on top of it all. 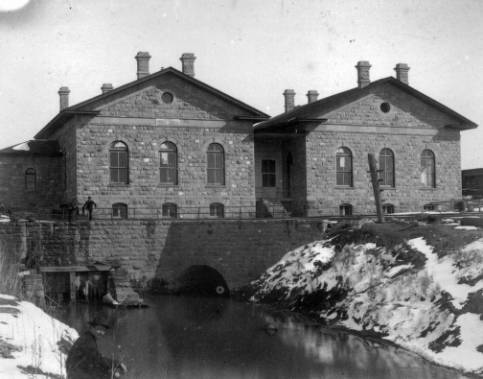 Again, the people of Denver called for more control over its water resource, and the 1874 law that lead to the purchase of Smith’s Ditch, would resurface in calls for public ownership of the utility. For many years the system expanded to accommodate the city’s wants and needs, experimenting with filtration and chlorination, and expanding storage capacity, significantly with the accomplishment of Cheeseman dam in 1905. Negotiations over the price would continue through multiple appraisals and city elections until it all finally sold to the new Denver Water Board for $13.4 million in 1918. “Why can’t the wheels of progress be attuned to the wheels of romance, and the mills continue using the power furnished by the great wooden wheels that the swift running ditch has been turning for half a century? Electricity is alright, I suppose, but I will hate to see the old-fashioned wheels scrapped when the ditch, as wide as a deep turbulent brook, is filled in,” (Bell, RMN 4/4/1927). According to this “City’s Oldest Beau” quoted above, those old millers’ rights were easily obtained and became part of the consolidated interests of Denver Water at that time. 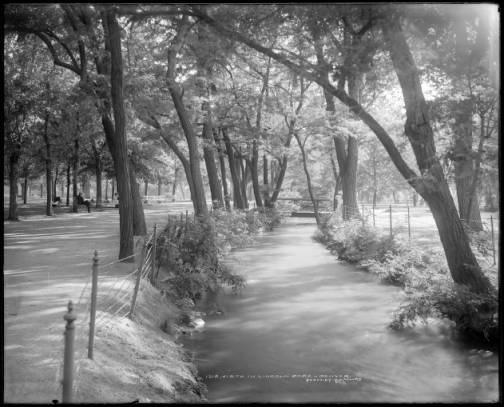 It must also be noted that after the Capital Ditch was completed, there were citizens that called for filling in the Cherry Creek nuisance as well, notably “History of Denver” historian, Jerome C. Smiley. 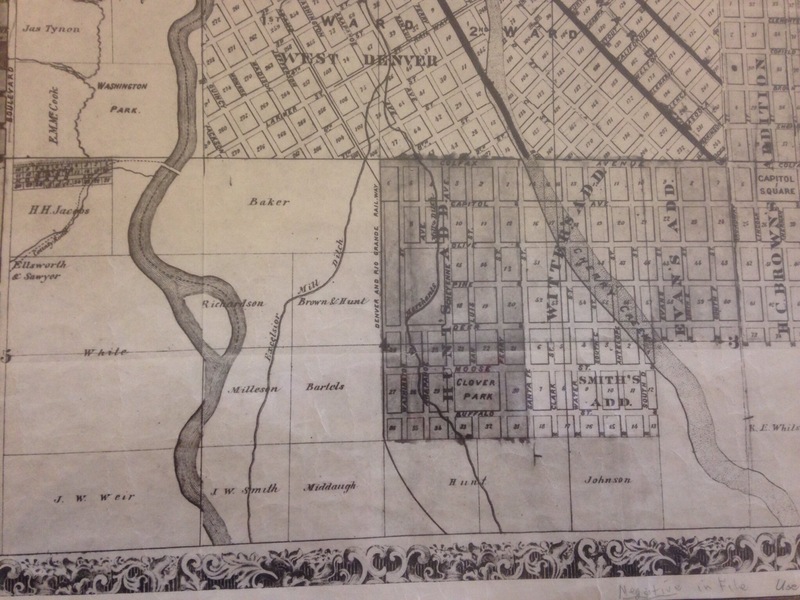 Map showing West Denver Ditches and Divisions, Courtesy DPL, Western History Collection. Click image to enlarge. Permit an aside to meet Nathan Addison Baker, and discover another layer of neighborhood history tied to West Denver’s Water Legacy. 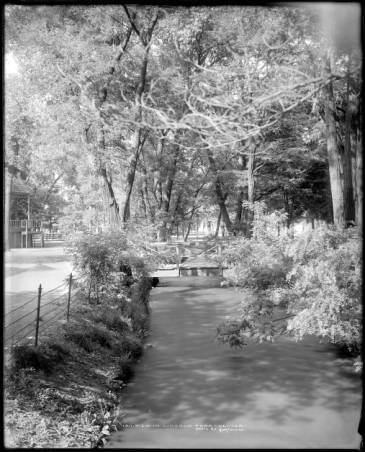 The Excelsior Mill Ditch ran through his land, and his home was in La Alma-Lincoln Park, but the reason he is mentioned here is the significance of Baker’s Spring to early residents. Ditch water, while acceptable for irrigation, was hardly preferable to whiskey for drinking. 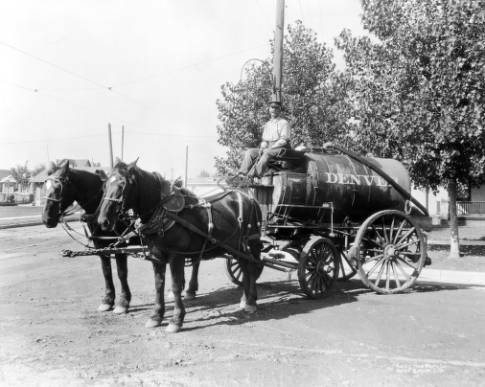 Artesian wells and springs, tapped from the Platte Basin below Denver, became the dominant deliverer of potable water. Wells were dug throughout the city, but a frequently cited source of sustenance was Mr. N. A. Baker’s spring. Baker’s Addition originally stretched from the river to the Denver and Rio Grande tracks, bounded by Grand Avenue (or Old Colfax heading toward Golden), and a line just south of today’s 13th Ave. Early maps place the Baker homestead close to the road, at the northwestern edge of the property, with a body of water just south of his residence. (Though today no trace exists, a later map places Pearl Lake on the same spot. Given J.W. Smith’s association to the Excelsior Mill and the name Pearl, one might infer another connection.) In addition to providing his water, Mr Baker opened one of Denver’s first schools and was known as one of the region’s esteemed newspapermen. The Denver Water story is fairly long and complex, with regional implications and national significance. 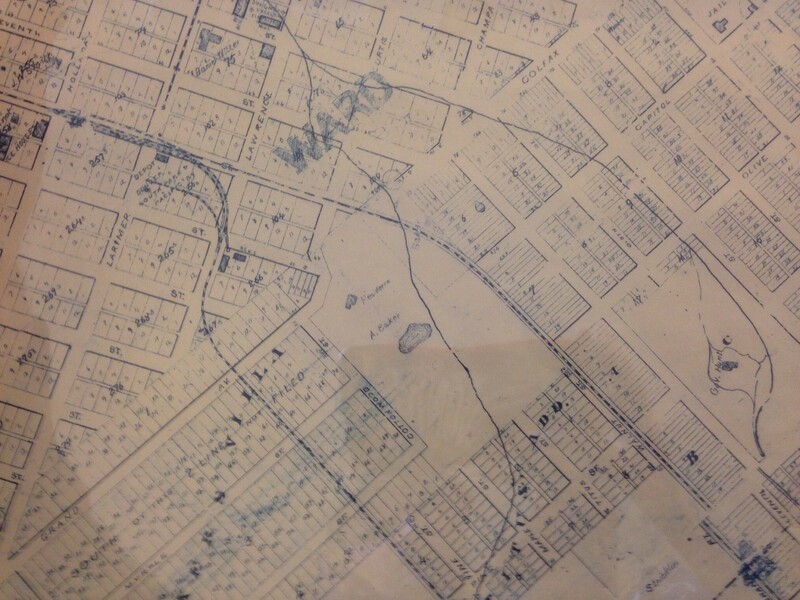 For a look back at life here across the creek, we can recall the tap records found in Denver Water’s archives for our home’s original owner, Walter Wilson. The three documents offer a glimpse into our past, and how water service evolved for average Denver residents. The first one is an attachment application, dated 4/26/1888, so it is likely a request for “Holly Water” pumped by the Denver Water Company’s facility nearby. I never found a reference about ditches servicing homes other than Hunt’s, perhaps the neighborhood received visits from a water wagon at first. The next one is a change order, dated 1/23/1890, for service from The Citizen’s Water Company. The free water offer did not appear until 1892, but competitive pricing likely provoked the change. 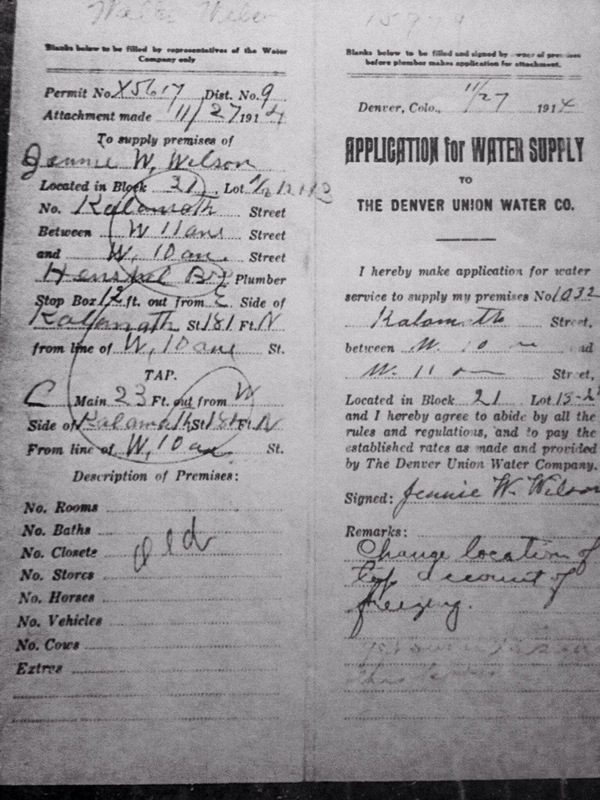 The last record of the Wilson’s is a 1914 request of the Denver Union Water Co to change the location of the tap due to freezing. I love this record because of the plumber’s description of thirty-year-old premises: “Old,” is scribbled across fields intended to list the types and numbers of rooms. A kind of post script must appear here in conclusion to address the destructive side of our water legacy, and bring us back to the present day. After many years of tragic flooding, the land across the creek contained mostly poor families and factories. Until 1965, flood mitigation for the area was largely neglected. 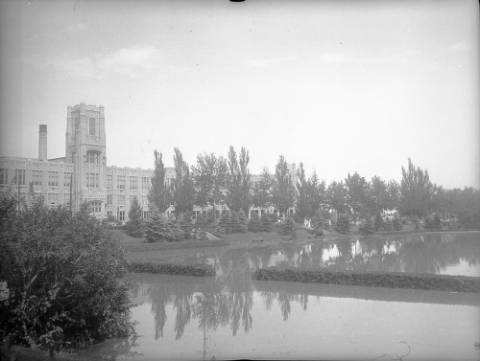 Once city leaders condemned the Auraria neighborhood to build the campus, a lasting measure was finally put in place. Today Chatfield Reservoir offers a lovely State Park and an emergency supply of water, but it’s primary role when constructed by the U.S. Army Corps of Engineers was to catch the spring runoff. That effort has helped keep the neighborhood (and Auraria Campus) dry since then, but the social and political impact of the residents’ removal has rippled through La Alma-Lincoln Park ever since. This story should remind readers of the important place West Denver has in city history, and offer some landmarks of the contributions. As Denver continues it’s path of growth, and the neighborhood draws reinvestment, Denver Water and city officials are hard at work creating new legacies in conservation, preservation, and recreation that should honor our forefather’s dream of a great city. *Note on J.W. Smith and today’s Capitol Hill: He happened to also own more town lots from the east side of Logan to the west of Washington, between Colfax and 12th. A lasting legacy remains today, as Pearl Street was named for Smith’s granddaughter.This prime location sat east of Mr. Brown’s lots near where the Capitol Dome would one day rise. *Neighborhood Note: Residents that today live between 10th, 8th, Delaware, and Santa Fe reside in Smith’s Addition, another holding of the successful and civic-minded businessman. In the middle of that parcel, he built the stone church that still stand’s at 9th and Galapago, then called Smith Chapel. His contributions to building a great city were many and varied, and deserve a closer look in a later post. He left Denver for California in the face of ailing health in 1882. A very special thanks is owed to Holly Geist, Denver Water Archivist. Without her knowledge and willingness to help, this post would lack the depth and dimension I hope it achieved. Credit is also due to the great staff and valued resource we have in the Denver Public Library and Western History Collection. Arps, Louisa Ward, Denver in Slices: A Historical Guide to the City, Swallow Press Books, Athens, OH, 1959. Bell, Donna, “The City’s Oldest Beau Rambles Through Denver of Other Days”, The Rocky Mountain News, p.10, Col.2, April 14, 1927. Byers, William N., “The Capital Hydraulic Company”, The Rocky Mountain News, July 25,1860, p.2, Col.3. Hall, Frank, History of Colorado, Blakely Printing Co., Chicago, 1889-95. Limerick, Patricia Nelson, A Ditch in Time: The City, the West, and Water, Fulcrum Publishing, Golden, CO, 2012. Sanford, Albert B., Alexander Cameron Hunt, The Trail, March 1925, Vol. 6, #10, p 3-9. Smiley, Jerome C., History of Denver: With Outlines of the Earlier History of the Rocky Mountain Country, The Times-Sun Publishing Co., Denver, 1901. Stone, Wilbur Fisk, ed., History of Colorado, S.J. Clarke Pub. Co., Chicago, 1918.